. 1 Comment Tags: Microsoft PowerPoint, Microsoft PowerPoint Course. Finding recent documents has been made easier in Office. Looking at PowerPoint 2007 and 2013 we will look at the differences between the ease of access. When you need to find a certain document you needed to click Open from Office button then search through your documents looking for the right one. With Microsoft PowerPoint 2007 you can find everything much easier. If you click on the Office button on the top left and it comes up with the main menu and on it will be your most recent documents that you have worked on and saved. So if you need to open up one of those documents again you can just click on it from that list and it’s done. So it saves you looking through your documents trying to find the right one. This feature can also be done in Microsoft PowerPoint 2013. All you need to do is click Open from the File Tab and your Recent Presentations can be viewed straight away just like below. 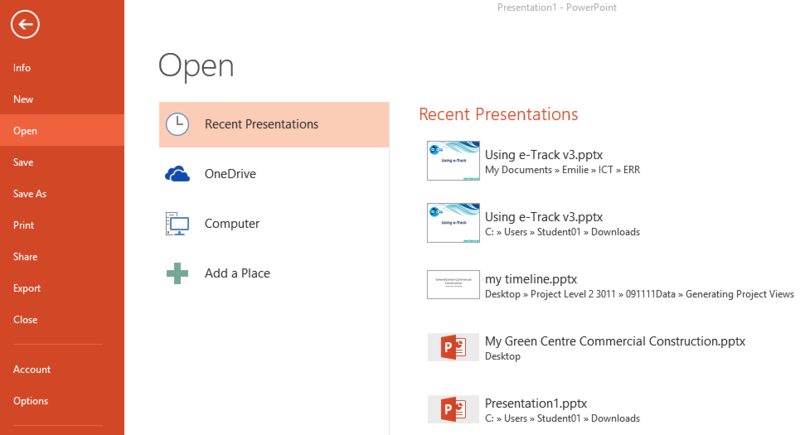 In PowerPoint 2013 you are able to see the first slide, making it easier to remember what presentation you want. Read about our Microsoft PowerPoint Courses if you are interested in learning more.